Love the place! Love the friendly staff! Love all the animals! Amazing experience. Thank you Charlie! Such a lovely environment as it's a working Spanish school but also a paradise chill out spot. I was looked after so well by Ricardo and we had such a wonderful arepa night. Tranquil, beautiful and great rooms as only ever 2 people per dorm! I had a wonderful stay here! The staff was very welcoming and informative about what to do and how to get around in Boquete. The hostel was very lovely, one of the nicest and cleanest I've ever stayed in. It has a kitchen and a small grocery store just a few minutes walk away for cooking. It's a 10 minute taxi ride out of the main Boquete center, but to get there is only 60 cents! I would definitely stay again. Favourite hostel we've stayed in - and we've been travelling for three months. Lovely relaxed home from home atmosphere. Wonderful kitchen space, with good quality utensils. Loved getting free organic eggs fresh from the hen, delicious free coffee and oranges from the garden too. Staff super friendly, clean and quiet room. Would recommend to anyone! What a hostel! If you are not into a party party hostel but instead like a very personal hostel with great style and super chilled people come here!! Spanish by the river is great for every traveller who is into feeling like in a family home!! Ricardo, the manager is very helpful and friendly and its great fun to stay there! Very clean house! 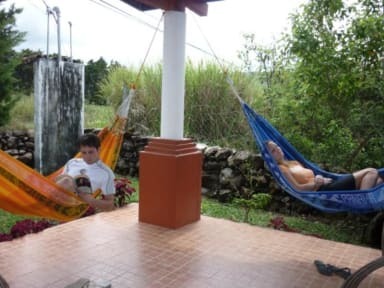 We had one of the best stays in Panama in Boquete thanks to this Hostel! You need to take a shared taxi to get in town but they are frequent and inexpensive. The owner / manager is very helpful and the hostel is one of the nicest and cleanest I have ever stayed in. Within two minutes walk there is a supermarket and two breakfast places that can come handy. Maybe not the best place to meet others but that can be a plus too. Different mix of people from most Hostels (older), kitchen in good shape, appreciated the 2 person dorms, the helpful staff and the fresh mountain air. The kid goat and chickens added to the relaxed atmosphere. The few minutes taxi ride (60 cents) to get into town didn't bother me. Nice place with a great common area and garden. A bit outside of Bajo Boquete town but you‘ll get there by bus or taxi within approx. 5min (bus can take longer). Relaxing, fresh eggs for free every day from the hens that roam the yard, small kitchen, ok bed, can't sleep in with people talking, or the hens.